ferito-LiveCarTracker is a live car tracking window that display the distance, in time, of the cars relative to the drivers car position. This application is very similar to the iRacing relative cars panel. It works on single and multiplayer sessions. On practice and qualify sessions, it display the relative position to the cars ahead and behind. Opacity, number of slots to display, font size and colors can be defined on a configuration file. Notification flags for race session (start, last lap, finish) and blue flag notifications are included. On the config folder there is a ferito-LiveCarTracker.ini file. updateThreshold is the frequency the app updates the information. Lower values will update more frequently. numberOfCars are the number of slots above and below the driver slot. For example, a value of 4 will display 4 cars above and 4 cars below. colors are the hex color representation 0xRRBBGG (web colors if you like) for each type of slot. aheadColor and behindColor refers to cars that are going to be lapped or lap the driver. - A bug at the start finish line, particulary at the start of race, that temporary shows drivers as lappers or being lapped. 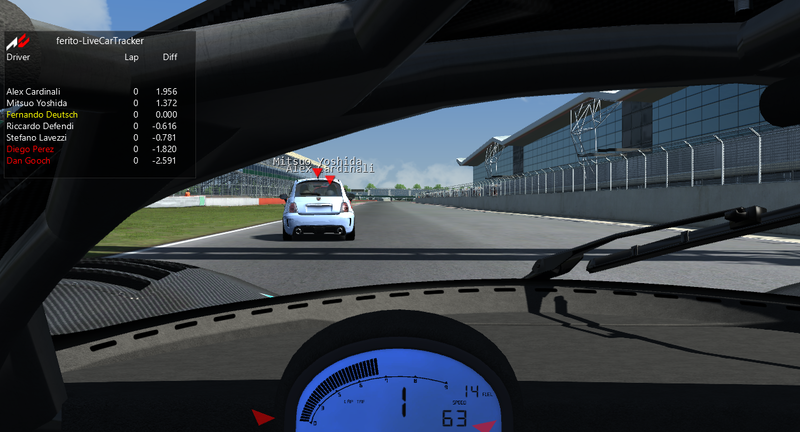 - A bug during the first lap that shows disconnected or parked cars on pits on position ahead to the player. This is corrected once the player finished his first lap. Trying to figure out how to work around this, hoping he AC python API gets fixed.